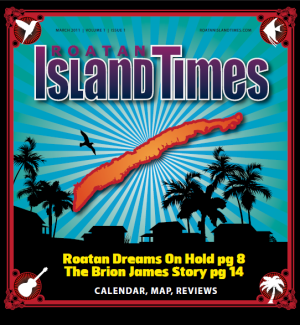 All the News that Fits: Will Roatan Island Times finally launch? he should be paid for developing the paper's layout, design, web site, logo, email system, blog design, project management system, business analysis and management. Mr. Eric's primary complaint is that the Stratton Brothers' negotiation style best resembles a Kashmiri carpet seller in a bazaar, endlessly haggling, following you around the market with his carpets in tow -- agreeing one minute to a price and then resuming negotiations as soon as the deal is about to conclude. "Neither Stratton brothers want me to make as much as either of them, yet they can't even get the team in the game -- they want my ball and my field to start." "They have no money to pay me, so the project was pitched as a partnership," said Eric. "Given they had no official project plan, spreadsheet, or forecasted sales and expenses, we could not determine what the profits would be from which I would be compensated. I suggested a 3 way partnership of the venture and Jeff, the intended editor, agreed." Once the name, logo, map, and layout had been designed by Mr. Numeric and the first issue laid out awaiting ads, Kevin informed Eric that "no way is he getting 1/3" but "keep track of your hours and we will pay you when we have the money." Given that the condition of Mr. Numeric's contribution to the venture was to be compensated with a 1/3 share of the business, Eric was taken aback considering the Stratton's publishing skills were quite sparse, and so far their only contribution to the project was three articles and one signed advertiser. Mr. Numeric developed the business plan, budget forecasts, found a printer, developed the rate sheet and sales materials in addition to building the first issue and web site. After months of deliberations, and over 100 hours spent on the project, Eric finally ceased working without a contract, on credit, while retaining all rights to everything developed including the logo, layout, map, web site, domain name, and project plans. It became clear at this point that the Stratton Brothers didn't have a clue as to what it would take to make this venture profitable. "I'm not a businessman," Jeff notes, "and Kevin likes to just wing it." Jeff recalls the night he and his brother sat at home drinking some Salva Vidas and came up with the idea to start a new newspaper, and Kevin would make a comic called 'The Salva Vidas', a beer bottle family resembling the 'Bud bowl' characters cracking jokes and clinking tops (yet to be written or drawn, by the way). "They are amateurs," says Mr. Numeric. "By not keeping to their word, and unwilling to share the fruits of months of hard work, we delay yet another issue. We are missing the chance to earn thousands over nothing. They are so afraid of anyone else making money 5 years from now, they won't even get in the game." After it became clear that Kevin wanted 100% control and ownership of the venture, using his corporation, his bank accounts, and his brother to write the stories, Eric asked Kevin what exactly he proposed as compensation for essentially materializing the vision. One third of the net profits of the first issue was the answer -- but no details on how net would be calculated. By Eric's forecasting model, it would be a three-way split of $1000: approximately $300. Eric rejected the offer and proposed that he would take a percentage of ad sales in lieu of a stake in the company and would retain the rights of the web site which he owned and developed. However, Kevin insisted ownership of the domain name, too, leaving Eric with no leverage and no security should Kevin ever decide Eric's services were no longer 'required.' Kevin suggested they go 'back' to a 3 way split but could not guarantee what that would be. Perhaps it was when Jeff became so frustrated with the whole charade that he threatened to kill himself if Kevin didn't accept Eric's offer that Mr. Numeric said, "I'm out. You guys are too dysfunctional for me." Mr. Numeric has since continued on with his development of the Roatan Island Times project and is open to prospective partners for the tabloid version. "I have done too much work on this to let it go to waste. I guess the Stratton Bros will soon realize the difference between having an idea and making it happen. Maybe they can find someone else to do everything for a case of Salva Vidas, I don't know, but they sure do not have the skills to do this project on their own."